If you’ve heard it once, you’ve heard it a thousand times. It’s that age old tale of boy meets band, boy spends everyday with band, boy falls in love with band, band suddenly changes mind and breaks boy’s heart. I know it happens everyday, but I didn’t think it would happen to me. I really thought Weezer and I had something special going. Was I a fool to think it would last? Grab a box of tissues and some Haagen-Dazs and let me tell you what really happened. It started out innocently enough. 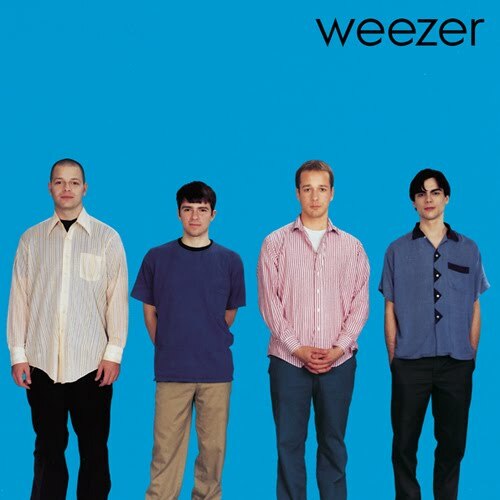 Weezer released their first album in 1994 and I really liked what I was hearing from them on the radio. As much as I love bands like Soundgarden and Alice In Chains, hearing “Buddy Holly” sandwiched between them was like a fun, refreshing shower from all that sludgy goodness. Then I saw the hilariously awesome video for “Buddy Holly” and I thought, “wait a second…these guys are pretty geeky…and I am pretty geeky too…this might just be crazy enough to work.” It all came to a head that magical night in the cd aisle at Target when I saw the album. The cover consisted of a monochrome background, a simple font for the band name and four guys dressed like dorky thrift store workers. No frills, nothing flashy; just like me. When I got home I went to my room and put the cd on. From that first acoustic riff transition into full band blast of “My Name Is Jonas” I somehow knew that I was on to something special, something different. Song after song came flooding out of my speakers like a letter addressed only to me. These guys didn’t fit in and didn’t always get the girl, but they made some of the best music I had ever heard. The bright, distorted guitar tones were so different than the muddy, dropped D sounds we were hearing a lot of at the time. They had guitar solos you could sing along to and some of the best vocal harmonies this side of The Beatles. These guys wrote smart because their melodies and chord structures were intricate but still ridiculously catchy. Even if you didn’t want to analyze one note or sound, they were just fun to listen to. However, in the initial dance of “wooment” you can be blind to the warning signs. I am a BIG liner note guy and the fact that Weezer’s cd booklet opened up to just a picture of their garage instead of lyrics should’ve been a red flag for me. But I didn’t see it. Maybe I didn’t want to see it. I was already in too deep. Around that time you could’ve asked me who my favorite band was and I would’ve told you The Beatles with Weezer coming in at a VERY CLOSE second. I seriously listened to that album everyday for a pretty long time. There was not a dud in the bunch. 10 songs of fuzzy, alternative greatness with one of the best album closers ever, “Only In Dreams.” If you hung out with me for any length of time, you were subjected, nay, privileged to hear the album over and over again. When they released their next album, Pinkerton, in 1996, my dad took me to Blockbuster Music the day it came out to get it. I was smitten all over again. Although the production was a little grittier and the lyrics had a little more angst in them, all the important Weezeresque ingredients were still there. I now had two milestonic love letters to have and to hold. Little did I know, things were about to change. I’ll condense this next part because it gets pretty ugly. Between Weezer’s two albums, bassist Matt Sharp started a band called The Rentals and they released an album. After touring behind Pinkerton, internal band strife caused Matt to leave Weezer and pursue The Rentals full time. Weezer dropped off the map. Everybody started their own little side projects and forgot about me. They stopped returning my phone calls. I was heartbroken. In 2001 Weezer tried to get me back by reforming and releasing a new album, but this was not the Weezer I had grown to love. Gone were the intelligent, emotional lyrics. Gone were the musical originalities and melodic left hand turns. Gone was Matt’s bouncy bass and falsetto BGV’s. Sure, there were signs of the old Weezer on a few of the tracks but it was just a glimmer of what we once had. Amanda and I saw them in concert in 2002 and as much as I really enjoyed the concert, it was bittersweet. They tried to remind me of the good times by playing a lot of the older stuff and I’ll admit it started to work. I was willing to let them back in. Make Believe came out in 2005 and I started to believe in us again. However, 2008 was tough year for Weezer and I. Although we took a bit of a step back with the rapping and the horrible lyrical shift on The Red Album, they also released a return to glory six song EP, Christmas With Weezer and I weakened. We were this close. Then Raditude happened. It is so bad that words have not yet been invented to convey both it’s hideousness and my disgust. It was the final nail in the coffin, the straw that broke the camel’s back and any other clichés you can think of. Barring Matt returning and a lyrical reevaluation by Rivers, the door is closed and we are done. We’ll always have the first two albums and the memories though so let’s end on a happy note. If you somehow luck out with producing a solid album of track by track perfection, you really have to go out with a bang. “Only In Dreams” is one of those epic, building, bombastic thrill rides that transforms a song into an actual experience. Every musician should take note because “Only In Dreams” is how you end an album. If I never see you again Weezer, have a nice life.